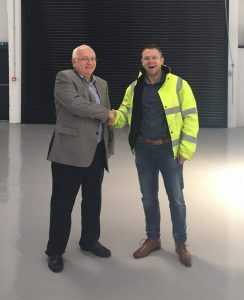 Due to the success of AJW Distribution (Essex) over the past few years we were extremely proud as a business to be able to move the depot into premises which were over double the size. After a few months of hard work from the landlord’s team we were extremely excited to see the final look of our new home for the Essex team. MD Alan Woods congratulating our Depot Manager Tom Woods for the great achievement of AJW Essex.